Leek digging is a spring ritual in north-central Pennsylvania. 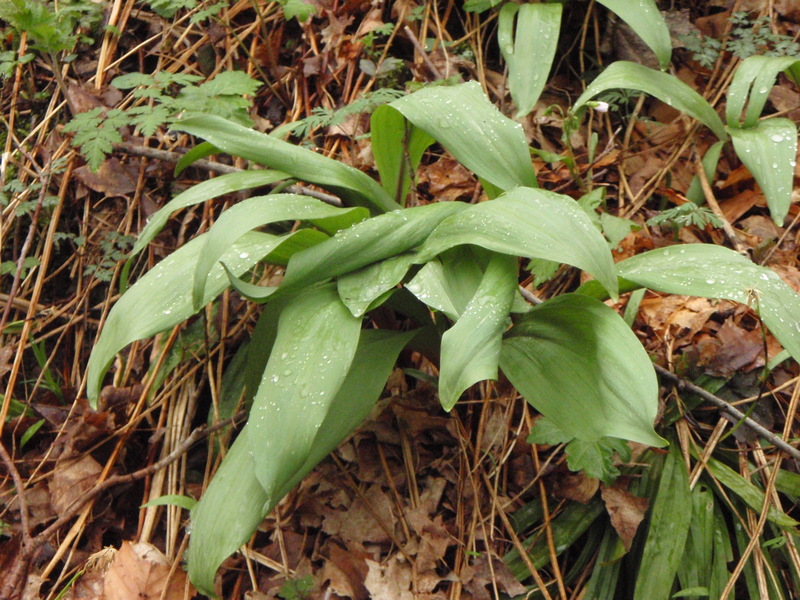 Leeks are also known as Ramps in some areas. Essentially they are a wild onion, quite fragrant in nature. Normally I start digging them about mid-April. By Mother’s Day the plants have reached their peak, and many might be even past their prime by then. Some people in this area dig them in February or March, but I like to wait for them to mature, since they are relatively large by that time and fill a digging bag quite quickly. I like to travel back roads when possible. After the short drive to Sizerville State Park I got on a road called Crooked Run. Lately there has been a bit of logging truck traffic on that dirt road. I was hoping not to encounter one on the way up the winding road since it is quite narrow in sections. 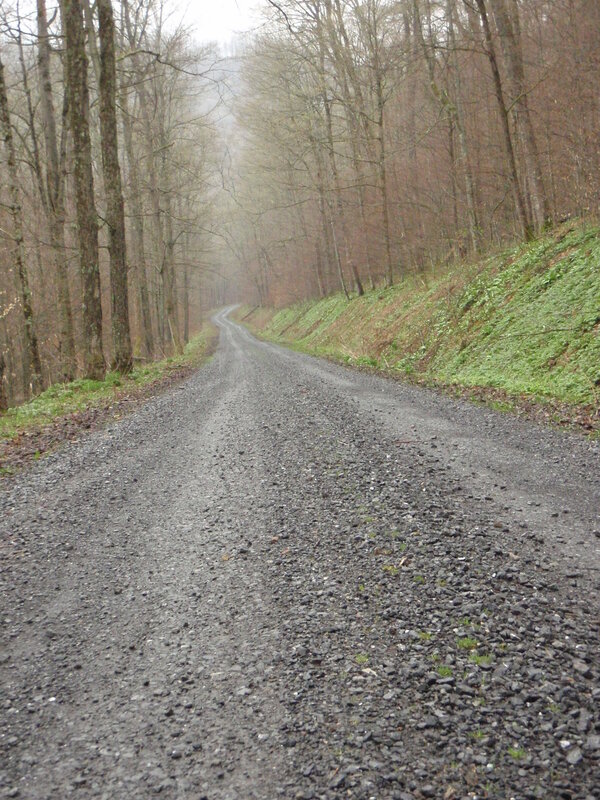 Crooked Run connects with the Ridge Road, and there are several nice Vistas on that road, which begins near the border of Cameron/Potter county and ends in southern Cameron County near the town of Sinnemahoning. 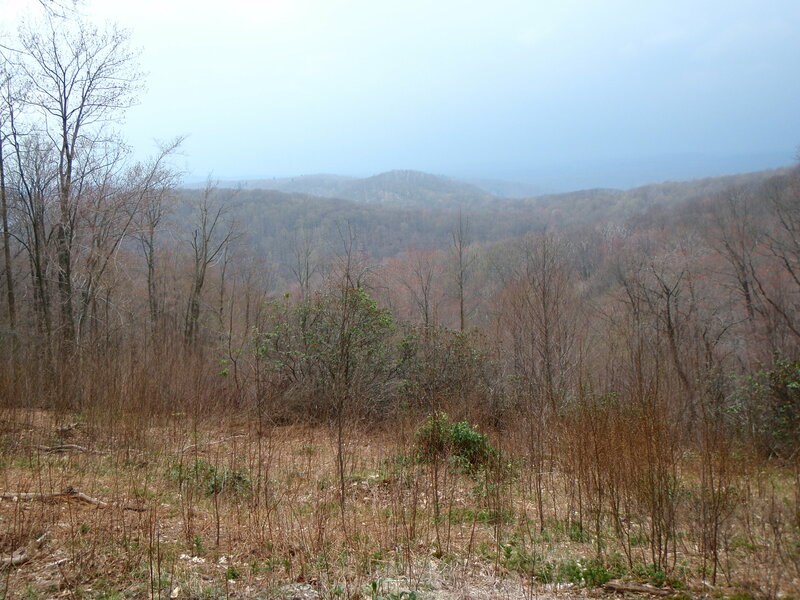 The sky was quite overcast and there was plenty of fog shrouding the Allegheny Mountains, which are more hill than mountain. I tried different exposures using landscape mode on my Olympus 850 digital camera, but I didn’t get good results. Soon I was back in my Ford F-150 and after a short distance I made a left onto Portage Road, which goes down a long hill into the small town of Costello. 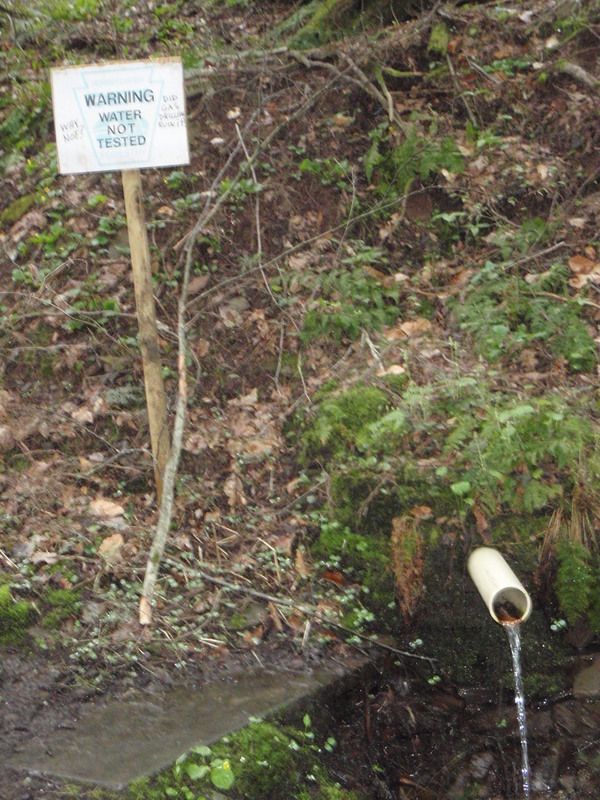 Near the bottom of the hill I stopped at a spring to fill a twenty ounce water bottle. The sign here wasn’t present last year. I filled my water bottle anyway and continued on to Costello. After going through that village I made a left turn onto route 872. That section of 872 is quite pleasant to drive. After passing some farms, hunting camps and the Austin-Costello Sportsmens club I finally came to a road that would lead me to my destination, Prouty Place State Park, which is the smallest State Park in Pennsylvania. 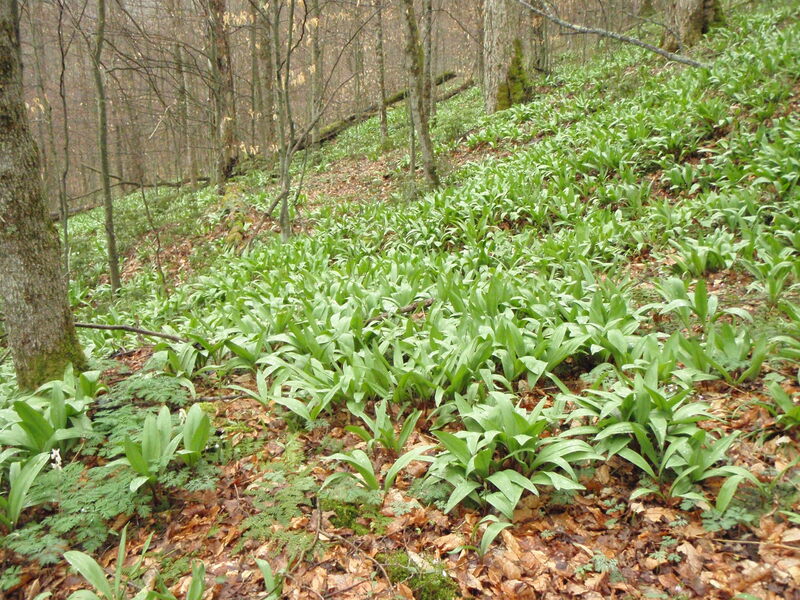 Before I even arrived at the Park I could see Leeks growing near the side of the dirt road. This is what I was after, a very mature Leek plant. There was a light rain falling, but I wasn’t concerned about that. It rained off and on the entire time I was digging Leeks, but it never even approached what would qualify as a rain shower. Finally I reached my destination which is less than thirty miles from my dwelling, but takes over an hour to reach. I could have arrived at my destination sooner had I chosen more paved roads, but they aren’t as fun to travel. This is a fair example of a mature Leek patch. A person could fill a burlap sack quite quickly here, although the idea is to dig just a few plants from each patch. That way they will spread the following year. If the entire patch were dug up the Leeks would not grow back there, or so I am told anyway. I walked alongside a talkative brook for a ways and then hiked up a hill. For a digging implement I used a pick with a sawed off handle which was sanded at the end and then wrapped with duct tape and also some electrical tape. The electrical tape doesn’t serve any purpose; I just like the way it looks. 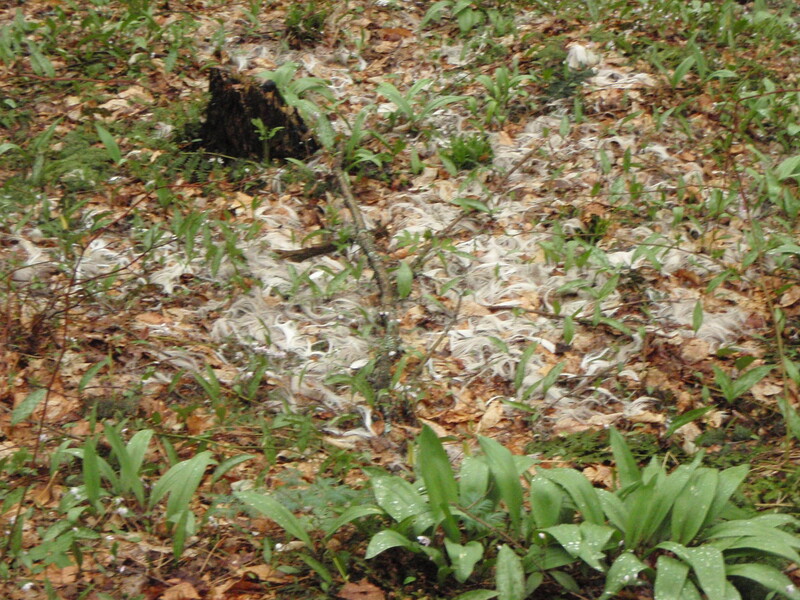 While visiting the many Leek patches in that heavily wooded area I came across the remains of a winter-kill. It was a hard winter here in Potter County. This poor critter didn’t make it through the rough winter. Fortunately most of the whitetail deer do survive the winter months though. Digging Leeks is pretty straightforward. They are removed from the earth and placed into a bag or bucket. Sometimes they can be removed easily and at other time the stalk breaks. Like anything else in life practice makes the job more productive. After about 1 1/2 hours I had two bags of Leeks dug. I was using nylon orange bags to contains the Leeks. I had a third bag to fill but not quite enough time, so begrudgingly I hiked back up the steep bank to my truck and drove back to Costello, but I chose paved roads for my return trip home. After the Leeks are dug they must be cleaned, although that doesn’t have to be done the same day they are dug. I hung up the nylon bags in my shed. After they are cleaned (a slightly time-consuming process) the Leeks will be stored in resealable plastic bags. Some of those bags will go in the freezer while others will be distributed to friends and family members who are no longer able to dig Leeks. Most likely the areas I visit in the future might become redundant. Gas is currently four dollars a gallon, so I am keeping my trips afield quite short for the most part. I’ll be roaming rural Pennsylvania, but only a small section of it until gasoline prices drop. I hope you enjoyed my Leek digging mini-adventure. This entry was posted on 05/03/2011 at 11:53 am and is filed under landscape, nature, Outdoor Activities, Outdoors, photography, photos, rural. You can follow any responses to this entry through the RSS 2.0 feed. You can leave a response, or trackback from your own site.